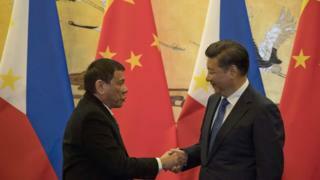 China's President Xi Jinping has welcomed his Filipino counterpart Rodrigo Duterte on a visit to Beijing which he described as a "milestone". Mr Duterte arrived on Tuesday for a four-day trip expected to boost trade and mend ties between the nations. Both sides were ready to move on from a bitter row over islands in the South China Sea, a top Chinese official said. The visit also shows Mr Duterte's efforts to engage China as he moves away from the US, a long-time ally. He has twice announced a "separation" of the countries, but a US official said no official request had been made to change their relationship. Meanwhile, nearly 50 police officers who were involved in clashes with pro-China protesters outside the US embassy in Manila on Wednesday have been suspended. During the demonstration, a police van which came under attack drove into the crowd, knocking people down. The dispute over the South China Seas did not take centre stage in Mr Duterte's discussions with Chinese officials. Why is the South China Sea contentious? "Both sides agreed that this issue is not the sum total of bilateral relations," Chinese Vice Foreign Minister Liu Zhenmin told reporters after the meeting. The two countries had agreed to seek "settlement through bilateral dialogue", he said. Mr Duterte and President Xi presided over the signing of documents covering several trade deals as well as co-operation in cultural, tourism, anti-narcotics and maritime affairs. The Philippine Department of Trade and Industry Secretary Ramon Lopez said on Thursday that the deals to be signed during the week would amount to $13.5bn. The relationship between China and the Philippines had worsened in recent years as both claim the Spratly Islands and Scarborough Shoal in the South China Sea. The dispute reached a peak in July when an international tribunal sided with Manila and rejected Beijing's claims. Although he maintained a blustery position towards Beijing during his presidential campaign, Mr Duterte sounded a note of reconciliation shortly after taking power. At the same time, Mr Duterte has said he would end joint military exercises with the US, admonished the US for criticising him over his bloody war against drugs that has been linked with thousands of extrajudicial killings, and said US President Barack Obama could "go to hell". On Wednesday, Mr Duterte told a cheering crowd in Beijing: "I will not go to America any more. We will just be insulted there. So, time to say goodbye my friend." On Thursday he repeated his pledge, telling Chinese and Philippine businesspeople: "I announce my separation from the United States. Both in military, not maybe social, but economics also. America has lost." "I've realigned myself in your ideological flow and maybe I will also go to Russia to talk to [President Vladimir] Putin and tell him that there are three of us against the world - China, Philippines, and Russia. It's the only way," Mr Duterte said. But an unnamed US official told the AFP news agency that the US had "not received any requests through official channels to alter our assistance to or co-operation with the Philippines". The president of the Philippines also used his speech to mock American accents, saying the American "larynx is not greatly adjusted to civility" - captured in a video shot by a journalist from the Philippines in China on Thursday. The BBC's John Sudworth in Beijing said Mr Duterte appeared to have calculated that taking a less confrontational approach than his predecessor on the South China Sea dispute would help him secure aid from China. For his part, Mr Xi welcomed the renewed friendship with the Philippines. "I hope we can follow the wishes of the people and use this visit as an opportunity to push China-Philippines relations back on a friendly footing and fully improve things," he said. What does Duterte want from China? China is the Philippines' second-largest trading partner, with the latter supplying mostly electronic products but looking to diversify with more food exports for instance. Earlier this year, angry Chinese netizens called for a boycott of Filipino mangoes amid tensions over South China Sea claims. The tensions also prompted Beijing to issue a travel advisory against the Philippines in 2014. Since then Chinese holidaymakers have flocked to elsewhere in south-east Asia; the hope is that they come back when Beijing lifts the advisory, which it has promised to do. In a pre-visit interview with Chinese cable station Phoenix TV , Mr Duterte complained of inadequate military support from the US and said he planned to buy Chinese weapons and boats as part of a military equipment overhaul. "If China does not help us in this endeavour, we will find it hard," he said. Mr Duterte's controversial war on drugs has attracted accusations of human rights violations by the West including the United States. But Beijing - no stranger to such criticism - has kept quiet, and has even pledged to support Mr Duterte. Duterte in China: Philippine leader turns conciliator-in-chief?